Colleen’s work has been very much in the news during the past few weeks as a result of the a project to identify human remains found at the site of a DC-4 airliner that crashed on March 12, 1948.Â As a result of this project, the remains were identified as belonging to Francis Joseph Van Zandt, a 36-year-old merchant marine from Roanoke, Virginia.Â The story was picked up by hundreds of newspapers – see the Washington Post and Anchorage Daily News stories here, for example.Â An MSNBC video is available here. The Genetic Genealogist:Â You are the Principal Genealogist for the Armed Forces DNA Identification Laboratory in Rockville, Maryland, and you were recently part of a press conference to discuss efforts to identify remains of a serviceman who died in the crash of Northwest Flight 4422 in 1948. What can you tell us about this work? Colleen Fitzpatrick:Â By far, the most meaningful moment of my life was last March when I stood in front of the Conway tombstone in the Mount Pleasant Cemetery, Askeaton, Co. Limerick, Ireland.Â It read “Dedicated by John Conway, Mount Pleasant, in honor of his dear father and mother who died in 1853, aged 53 years.Â Also his wife Ellen and her children Michael and Lizzie.” Our search for the identity of the remains found in the crash of Northwest Flight 4422 was at an end. It had been a long journey to this moment- almost nine years to discover the link between the Conway family of Askeaton and the frozen hand and arm found in the snow of the plane that crashed in 1948 in a remote area of Alaska. Our investigation team was composed of the top experts in the field of DNA analysis, fingerprint identification, and forensic genealogy.Â The key to our success was that not just that our team members were accomplished scientists and genealogists, but also that we were all dedicated to working together to making an identification. We worked side by side with no rivalry.Â Each of us competed only with himself to do his best.Â There were many times each of us faced discouragement, but everyone was determined to do everything possible to identify the remains of the serviceman who died in the accident. As we eliminated one passenger on the plane after the other, through fingerprints, through DNA analysis, or through both, the possibility occurred to me, as it did to each of us, that we might never find a match.Â It was possible that there was someone onboard who was not listed on the passenger manifest – perhaps a CIA agent.Â Another possibility was that the victim’s female line had died out – that there were no living family members to use for a mitochondrial comparison. If so, a DNA match would be impossible, and if the victim did not have a fingerprint card archived by the military, there would be no fingerprint comparison to fall back on. Still another possibility was that one of the passengerâ€™s family members had not been honest and had submitted a DNA sample from a friend or another relative, producing a non-match where the results should have been otherwise.Â In all of these cases, the hand and the arm would probably remain unidentified forever. We all held our breath. Finally on Thanksgiving Day 2008, our search was over. 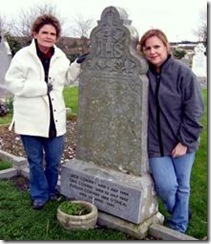 My forty yearsâ€™ experience with Irish genealogy, combined with a lot of creative thinking and persistence, paid off. We obtained a mitochondrial DNA match between the remains and Maurice Conway, a retired maintenance supervisor I had located in Askeaton, Co. Limerick. Maurice was a distant cousin of Francis Joseph Van Zandt along the exclusively female line of his family. Frank was the second to last passenger we had left to investigate. Even better, Maurice proved to be a double match to the remains â€“ not only did his mtDNA match Frank’s exclusively female line, but his Y-DNA matched that of the descendants of Frankâ€™s maternal uncle from upstate New York. In the meantime, a fingerprint match was made between the hand and Frankâ€™s military records, for a triple confirmation that the remains were those of Van Zandt. This was the best we could have ever hoped for! The publicity we have received announcing our success has been overwhelming to me. The news of our press conference was published by the Associated Press and was picked up by 300 newspapers worldwide. A video clip of the conference was shown on both MSNBC and CNN. Feature articles are now coming outâ€“ two appeared just this week in the Irish Daily Mail and the Irish Independent. There is even a documentary planned for the coming year. TGG:Â Stay Tuned for Part II tomorrow! Marilyn – have you tried entering your information into public databases like ybase or ysearch to find potential matches? Pingback: Does DNA Link 1991 Killing to Colonial-Era Family?